Don't you love a little ruffle? but a bit of a ruffled on pillows or bedding or on a table is charming. A drapery panel that is $19.99 at Target. than it would be with a standard shower curtain. 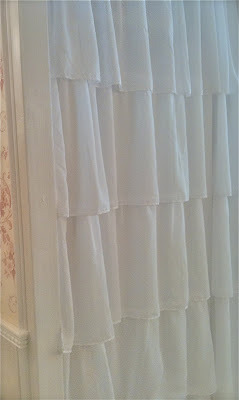 and also gives the curtain a 'cleaner' look than using shower hooks. They really are fabulous and romantic! Such pretty images! I love how feminine and pretty ruffles are, and love them on a table. Thanks for sharing. Ooh, your post today is rufflicious! I love ruffles too and I'm so glad there are so many home decor items featuring ruffles. A girl can't have too many! Oh, I absolutely love those as shower curtains. Those ruffles are just so dreamy! I can't believe you found them at Target! I have their Shabby Chic shower curtain but it's not nearly as pretty as the panel. Oh ruffle love....oh, how I love thee. I love the look, Courtney. It looks so flirty and feminine with the toile! Very pretty Courtney! 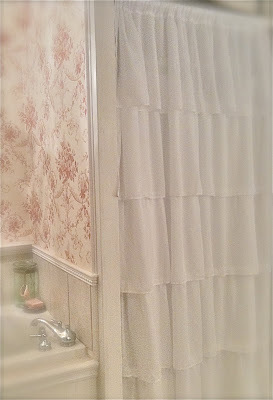 I never would have thought to use drapery panels for a shower curtain, but you can bet I am now. I am SO fussy about them and everything is so plain or masculine looking. Thanks so much!! 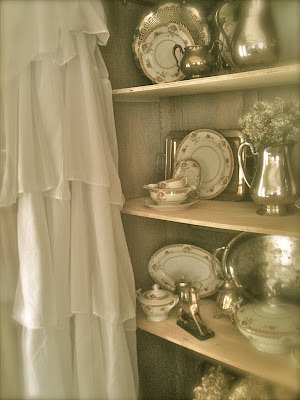 Love the ruffles, and all the goodies on the shelf near by the ruffles!! the absolute perfect choice - it looks so wonderful in your bathroom. just love it! Love this! the idea of using curtain panels is fantastic, you wouldn't believe the complicated idea I head in my head for hanging my shower curtain higher lol. This is one of the many reasons I love blogging. It looks so pretty. Thanks for the tip. Beautiful, love the idea! 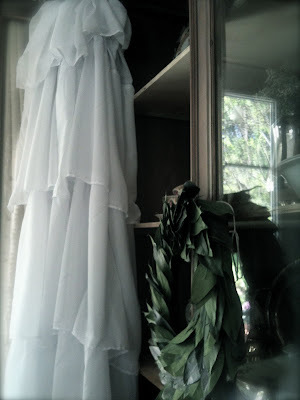 I used the same curtains for a petticoat for my treadmill. You cannot beat the price and they really are very beautiful!! Oh so pretty! I love ruffles and your new set is beautiful. What a great idea to use a curtain. Drapery... Brilliant! That is exactly what I am going to do! And two rods , one for curtain... one for the liner. again.. brilliant! ANd oh my yes, ruffles make my heart sing! Oh yes! I love this look! So romantic! Happy WW! Beautiful and romantic, Courtney! I love ruffles too! That's a perfect shower curtain, what a great idea! LOVE ruffles! Using the curtains as a shower curtain is the perfect idea. Really pretty. Thanks so much for stopping by today and I will certainly participate in your linkups in the future! Oh yes, there is nothing more romantic than ruffles, that shower curtain looks fabulous, does husband complain about ruffles? mine does! I'm a ruffles lover too! i LOVE a bit .... a lot!!!!!!!!!!!!!!!!!!!!!!!!!!!!!!!! Love the ruffles and the price! Gorgeous as usual. You have set the bar high. Thanks for the inspiration. That's a great tip, the curtain panel for the shower curtain. How much prettier it will be with the panel reaching the floor. I'm ga ga for ruffles!! I wish I could ruffle everything up at my house but the hubbs would lose his mind! LOL! NOt sure how I missed this ruffle post! I am a ruffle fan. 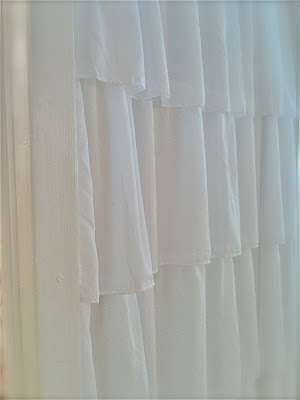 Nice price on a pretty curtain panel...now where can I use these? I adore ruffles and this is so beautiful Courtney. I need a new shower curtain as well and have been looking, I will have to expand that into the curtain isle! :) Thank you! I love the shower curtain Courtney! I am wanting to redo the guest room/bathroom and have been looking at ruffles.